AMAZING THINGS ARE HAPPENING in relation to Boys to Men mentoring network!! A woman from the local Hospice who does grief counseling just called me. She saw the TV interview on NBC-17 on Tues. talking about Boys to Men and wanted to know how to get boys who are experiencing grief (most from losing their fathers) to connect with our local group. She had never seen the show before and normally wasn’t home during that time of day). NOW, isn’t that amazing?!!! I’m very excited about what great things are coming out of this for Boys to Men! WEDS., SEPT. 15th: I’ve got something rare going on right now, today: PEACE. I find myself at mid-day suddenly calm and reflective (not, my natural state most of the time during these past 5-6 weeks). Bottom-line: I’m OK now with whatever happens (12th place, 11th, 10th, 1st or 32nd) whatever!). I am LOVED. I have a wonderful family, friends, and a great community to work and play with around me. There are a lot more people who will hear about mentoring and Boys to Men than they would have without this contest. There is a party to put on and much needed funds to raise to send boys on amazing, life-changing week-ends called Rites of Passage Adventures. I’ve been so affirmed in the last few days with support from friends (they’ve changed everything for me), associates and the local media community and the press. Life is good, no very good. I will stay busy and focused, but no more spinning or worrying or fretting. Now is the time to enjoy the end of this climb up this “mountain” where the air is fresh and clear and the view is spectacular. This is going to be a LOT of fun! Come join me tomorrow, and tomorrow night. Lunch with AMA folks to learn about “Engaging” verses Marketing from guest, Scott Stratten (I’m already a believer form what I’ve learned these last 5-6 weeks). The fundraiser at Bogart’s, then OpenLink Networking Event by LinkingRaleighNC.com across the street at Solas, and PechaKucha (SPARKcon) back across the street again. If you’re not at the NSCU game, then downtown Raleigh is the place to be tomorrow night! OH yeah! Take a moment to VOTE, maybe over coffee or a snack: 11,174 Votes at 3:15 p.m. WOOO HOOO! SUN., SEPT. 12th: Funny that I put in my post, “9-Day Casting Call Forecast” a few days ago, “PRAY for RAIN.” Guess what?! We have a beautiful, soaking rainfall going on outside today in the Raleigh area! I take that to be a very good sign. I needed that this morning. I have to admit that being in 11th place in the Casting Call Contest, having multiple, conflicting obligations (there are things I want to do, that I KNOW would get awareness for Boys to Men and more votes but I just cannot do them all) , having limited funds, planning a fundraising event, and just having more to do than there is really time to do it, is a BIT STRESSFUL. The rain, plus this verse, helped give me much needed motivation me today, “In quietness and trust is your strength.” Is. 30:15b. All of you guys who have been helping, voting, and supporting have also been a constant source of encouragement. Thank YOU! SAT., SEPT. 11th: Took a break from sending out voting requests today in order to remember 9/11 victims, families, and honor the armed forces. FRI., SEPT. 1oth: Fantastic Triangle AMA Special Combined SIG: Social Media and Direct Marketing meeting at CapStrat in Raleigh. Thanks to Cord Silverstein, Brian MacDonald and the great group of experts there for letting me come and giving me so many great ideas for the last days of the Mad Men Casting Call campaign. THURS., SEPT. 9th: Great interview on “My Carolina Today.” Great chance to get the word out about Boys to Men. Please be sure to watch on Tuesday, Sept. 14 at 11 a.m. on NBC-17. WEDS., SEPT. 8th: Stress got to me a bit last night, because of just too much too do to keep getting the word out about the contest, work and financial issues. But I feel better today. Here’s why: “For I satisfy the weary and refresh everyone who languishes.” Jer. 31:25. I;m choosing not to sweat the small stuff today, and am doing only what I can within reason. Getting ready and excited about my interview on “My Carolina Today” tomorrow (to air on Sept. 14th at 11 a.m. on NBC-17. Got a new post out, Raleigh’s Mad Men, thanks to New Raleigh and Ladye Jane who gave me permission to re-run her most excellent article. SUN, MON, TUES, 5-7th: Took some time off to doing family stuff, help someone move, etc.. Did put out a blog post about my support for Boys to Men mentoring network. SAT., SEPT. 4th: Great Camping at Jordan lake with my FOC friends and family. A much needed break! Thanks for still voting though still a holiday! So, Thanks for and excited to be able to represent Boys to Men Mentoring Network. Please support/DONATE to this great cause! 8269 VOTES at midnight! 4:30 P.M: Time to go camping folks. Great day! See new post for all the news: http://bit.ly/MediaTwoMadMen (especially TV show I’ll be on on Nov. 14th!). Also, Check out the great post from H,M&P, my first job out of college! HAVE A GREAT LABOR DAY WEEK-END! Thanks for voting everyday! 8147 VOTES at midnight! #9 looks so fine! 8000+ VOTES!! Broke the 1000 hits mark on this blog! We’re moving up! New great social media ideas from MediaTwo and Raleigh’s finest experts on my new team (look for post/video on this). The heat is on: 15 more days. Watch for new social media campaigns rolling out tomorrow! 8060 VOTES at midnight! WOW!! Big, big day!! IN THE TOP TEN MEN!! It’s a contest again!! We are going to win this! Thanks to everyone who didn’t give up when things looked grim! A team of friends is going to come together to brainstorm tomorrow @ my good friend’s, MediaTwo‘s cool office space in downtown Raleigh for the final, 16 days to take it this to the next level! Plus, big new story in the N&O! 7883 VOTES at MIDNIGHT (200 votes today! That’s the best yet, y’all)! Thanks everyone!! Had a great coffee time at Electric Beanz with Inside919, a great lunch at The Raleigh Times restaurant with Matt Muñoz of New Kind, president of AIGA Raleigh to discussed bringing “Design Ignites Change” to Raleigh. PM: learned a lot from Phil Buckley ’bout blogging at a Meet-up group: Building A Content Strategy and Getting to the Next Level at Isaac Hunter’s Oak City Tavern. 7683VOTES at 10:15 pm! Happy that the new blog post got posted! Check it out: “Who are you supposed to be?” Unmasking Mad Men. Pleased that Mad Men won 4 Emmy’s. Congrats to all! Glad to finally get some quots requests for real work. Perhaps my work recession is about to end. Glad I could help my friend Will move into his new place, and I could hang with my buds at MacGregor Draft house to end the day! 7652 VOTES at midnight! Trying to finish up a new blog post, between making pancakes for the kids and sleepover friends and then picking up wife from the airport ay 2 pm. Wish me luck! And Yeah! She got home safely! Clean up day. Time to start working on some new posts about CHANGE, once the house, office and computer are all cleaned up. 7572 VOTES at 11:38 am. Recovery day from the Solas Mad men Mixer Remix. Meeting about work as a “real ad man” (some promising prospects ahead!). Lunch with my Catevo alumni (greatest people to ever work with). I ended up being the only man among 6 lovely ladies. It was very nice, but I forgot to bring enough gossip, and so was fairly quiet most of the time. Forget CNN, NPR, FOX. After lunch with six very bright and active women, I now know what is REALLY going on the the world! Finished the day by buying some BBQ from Scout troop 391, adding some greens, and some how pulling together a complete, balanced meal with my 2 kids at home, while my wife is off visiting her dad. Then daughter went to football game with friends,a dn my sin and I enjoyed “Clash of the Titans” together. 7431 VOTES. Lot of fun and probably 125-150 folks came through tonight at Solas. A little dress up. A little dancing. Some little prizes. A bachelorette party. Thanks to local Banana Republic for the stack discount coupons to give out. Thanks to DJ Freedom for great music, and Solas for a great venue. Thanks to my friend Mark, volunteer/mentor with Boys to Men for showing up all dapper (he wins the best dressed for sure) and helping me give out tickets, and raise awareness for Boys to Men. Whew! Next party is definitely earlier (10 PM is past my bed time!). Gottta’ get kids to school at 6:30 in the morning. Good Night. Thanks for everyone’s support! Hopefully, will a have a couple of pix tomorrow! You never know what CHANGE you can make by just speaking up! I emailed customer service at AMC on Monday after 1200 votes mysteriously disappeared. Apparently, a man, I’ll call him John, who goes to my gym, Seaboard Fitness, also sent an email to them (unbeknown to me) explaining that there were issues with voting, and that they really should have a security form (you know, one where you type in what you think you see from the funny-looking words/groups of letters in various grunge typefaces. I often fail the first time myself and thus struggle with feelings of subhumanness for a few seconds until I actually, eventually get the right answer. Yes, doing that always seems a bit annoying. However, I actually had heard a few people (computer brains) express disbelief that this sort of thing was not already in place for a contest like this, saying that there was no other way to guarantee that a real human was voting and not a “bot” (a software program that acts like a robot to automatically make computers ruin as script of actions, like voting). Lo and behold, they did it! 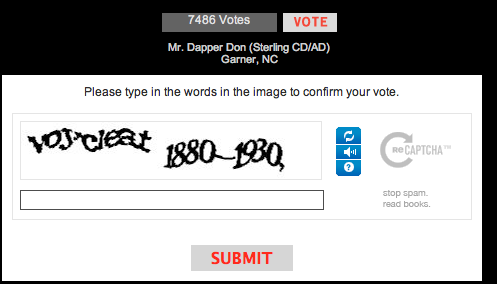 On Tuesday, the security feature first showed up on the voting web site. So, when I saw John today, I said thanks for speaking up! It will guarantee a much more fair competition from here out, Plus, I got a very nice, personal email from the lady in charge of the voting website. Good job AMC for adding security, and oh, fixing the disappearing votes problem, too. Thankful for the very nice blog post today in the News & Observer BIZ Blog, and TheCharlotteObserver.com and a lot of new press. Especially grateful for all the posts all over town for the SOLAS MAD MEN MIXER REMIX on various sites. Please join us tomorrow night for some late-night dress up, timely music and smooth martinis!! RSVP and please come out for fun at Solas Restaurant lounge & Rooftop.